Without question, 1994’s The Lion King represented the apex of Disney’s resurgence in its era. 1989’s The Little Mermaid brought them back to prominence after a long down period, and 1991’s Beauty and the Beast marked a level of hitherto unseen critical praise as the movie earned the first-ever Best Picture nomination for an animated flick. 1992’s Aladdin didn’t duplicate that feat, but for the first time in many years, it produced a Disney animated film that won the race for the year’s top box office total. Lion King didn’t break new ground in any of these categories. It didn’t get an Oscar nomination, and it came in second place at the box office behind Forrest Gump. However, with a gross of $328 million US, it made more money than any traditionally animated Disney movie before or after, and it demonstrated just how far the studio had come since the dark days of the Eighties when Disney animation barely survived. Unfortunately, cel animation is once again an endangered species, and it’s hard to believe it’s only been 23 years since King lit up box offices. I’ve dwelled on those issues elsewhere and won’t do so here; traditional animation’s in enough trouble that I don’t want to kick it again. Instead, let’s focus on the positives, and King surely presents one of Disney’s greatest achievements. This leads to the story’s main plot point. Scar conspires with some hyenas named Shenzi (Whoopi Goldberg), Banzai (Cheech Marin), and Ed (Jim Cummings) to off both Mufasa and Simba so Scar can become king. This succeeds partially, as he stages a wildebeest stampede that kills Mufasa. Scar convinces Simba that the lad caused his dad’s demise, and the youngster runs away from home. Scar sends the hyenas to finish him off, but when they see him scoot into desolate land, they decide he’s as good as dead anyway and don’t bother to act. Ultimately, though, Simba learns he can’t escape his past. With Scar in charge of the pride, his homeland lies in ruins. Childhood friend Nala (Moira Kelly) goes out to look for help and she encounters Simba (Matthew Broderick) when she attempts to chow down on Pumbaa. He learns what happened to the pridelands but resists her efforts to get him to return, even though romance blossoms between the pair. 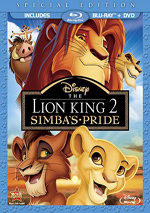 Eventually, though, primate shaman Rafiki (Robert Guillaume) tracks down Simba and teaches him a little about his regal heritage and the way things work. This sets up the film’s climax in which he confronts Scar and attempts to fix matters. No matter. Whether or not one considers Lion King to offer an original tale, it works spectacularly well. From literally its opening moments, the movie sets itself apart as something special. The musical number “Circle of Life” and the ceremony in which the jungle animals pay homage to Simba launches the film in a daring and dramatic manner. It runs four and a half minutes without a word of dialogue, so we don’t know who these characters are or why we should care about them. After that remarkable introduction, one might fear that the movie would falter, but it never does. Oh, some parts seem less compelling than others. Despite its commercial – and Oscar – success, I still find “Can You Feel the Love Tonight” to offer one of Elton John’s more insipid numbers, and frankly, a lot of the elements that involve the romance between Nala and Simba seem extraneous. It often feels like they occur just because it’s a Disney movie and you need some lovin’ and wooin’, even if it is between animals. Other than that minor misstep, though, I’d be hard-pressed to find much fault with Lion King. I can’t think of a single scene that falls flat, and nor can I conjure a voice actor who fails to provide stellar work. Irons stands out from the crowd with his sneering and insolent performance as Scar, and Jones brings the right level of depth and regal presence to Mufasa. As the adult Simba, Broderick appears appropriately unsure of himself, but he pulls things together well when he needs to become more powerful. Thomas seems nicely spry and frisky as little Simba, and he also turns the character’s emotional moments into ones that pack a definite punch. Instead, it’s the dramatic staging of the sequence. The animators play up the scene for all its emotional worth, and it turns incredibly powerful. It’s almost impossible not to feel shocked and distraught when Scar turns on Mufasa, and the poignancy of little Simba’s reactions to his father’s demise remains heartrending. Put simply, this sequence is a stunner of action and emotion. Despite the power of the wildebeest scene, however, the movie doesn’t run out of gas. No single element may live up to that one, but the remainder of the film continues to impress. It helps that we find possibly Disney’s best-ever comic sidekicks in Timon and Pumbaa. Sabella and Lane exhibit terrific chemistry together and they make the token buddies into some of the studio’s most memorable characters. 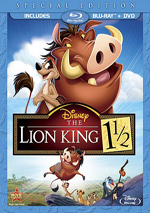 The Lion King appears in an aspect ratio of approximately 1.78:1 on this Blu-ray Disc. Across the board, this was an impressive presentation. From start to finish, the movie displayed excellent clarity. All shots exhibited good to great definition, as nary a soft spot appeared. The image lacked jaggies or moiré effects, and it also showed no signs of edge haloes. Print flaws remained absent, as the movie was always clean and fresh. With its jungle setting, King gave us a wide, varied palette that the Blu-ray replicated well. From the lush landscapes to the animals to all other elements, the hues always came across as lively and tight. Black levels looked solid, while low-light images were concisely displayed and tight, with no excessive opacity. This was a consistently excellent visual presentation. The Lion King also provided a pretty strong DTS-HD MA 7.1 soundtrack that featured a very active soundfield. All the channels presented a lot of different elements that made them work constantly throughout the movie. Music emphasized the front speakers, but the score and songs also used the rears for solid reinforcement and occasional unique elements. Stereo imaging was very fine. Effects played an active role in the proceedings and helped bring the action to life. Quieter sequences demonstrated a nice feeling of atmosphere, while louder ones kicked the track into higher gear. The mix really helped bring even greater power to sequences like the wildebeest stampede, as unique material came from all the speakers to create an engrossing sense of environment. Overall audio quality seemed excellent. Speech across as natural and crisp, without obvious issues connected to the lines. Music varied somewhat but usually was solid. A few of the production numbers lacked the dimensionality I expected, but those examples remained fairly minor, and the music was usually rich and full. Effects always sounded accurate and dynamic. Those elements presented good bass response and seemed tight and well defined with no signs of distortion. This was a nice auditory experience. How did the 2017 “Signature Collection” Blu-ray compare to the 2011 BD? Both seemed identical in terms of quality – if the picture/audio of the 2017 disc improved on the 2011 release, I couldn’t discern these differences. In terms of quality, that is, as the 2017 disc did correct a good on the 2011 BD. The latter suffered from an error in which clouds disappeared from the scene in which “Ghost Mufasa” spoke to Simba. The 2017 disc restored these. The Blu-ray mixes old and new extras, and we start with an audio commentary from directors Roger Allers and Rob Minkoff with producer Don Hahn. All three sit together for this running, screen-specific track. Taken straight from the 1995 laserdisc release, the track seems very solid. The trio cover pretty much all the appropriate topics. They hit on various animation challenges, casting and aspects related to the voice actors, script changes and character development, research, and many other elements. The three men display nice chemistry and interact with vivacity and good humor. A little too much happy talk shows up at times, and the track drags a little during the film’s third act, but overall, this seems like a useful and entertaining discussion of the movie. Under Bloopers and Outtakes, we get a three-minute, 44-second reel that provides an unusual piece. It takes a mix of actual slip-ups and jokes from the voice recording session and matches them to the animated animal “actors”. That’s an unusual approach but it’s kind of fun. Five Deleted and Alternate Scenes come next. Including a 29-second introduction from Allers and Minkoff, these run a total of 12 minutes, 42 seconds. We find “Zazu Flatters Mufasa” (0:27), “’King of the Wild’” (2:23), “Scar Wants Nala As His Queen” (5:08), “Simba and Nala Reunited” (3:19) and “Zazu Flatters Scar” (0:52). All of these consist of story reels that show filmed storyboards combined with audio. Some use the actors who appear in the film, while others feature scratch dialogue/vocals. Should any of them have made the final cut? Probably not, but some interesting side stories appear. “Queen” allows Nala to have a little more screen time and creates an intriguing love triangle theme; it’s probably the best of the bunch. On the other hand, “King of the Wild” is a dud; in it, Mufasa croons a jaunty tune, and it doesn’t work for the character. On the prior release, Allers and Minkoff introduced each scene, but here, we only hear from them at the start. Why did the set drop their other comments? I have no idea. On the prior DVD, The Morning Report was integrated into the film. Originally part of the Broadway adaptation of The Lion King, here it gets adapted smack into the movie. However, don’t expect a substantial production number. Instead, this tune simply substitutes for Zazu’s previously spoken chat with Mufasa early in the movie. It’s a short song and only added 44 seconds to the film’s running time. It’s not especially interesting, but it’s okay, and I’m glad the two-minute, 30-second clip appears here, though I’m surprised we don’t get the alternate version of the flick that included it. If the DVD provided two versions of the movie, why doesn’t the Blu-ray? The remaining extras are new to the 2017 “Signature Collection” Blu-ray. Visualizing a Villain runs two minutes, 53 seconds and offers an odd music video of sorts. Set to “Be Prepared:, we see movie clips mixed with a dance performance accentuated by an artist who “live-paints” Scar. It’s strange and not at all interesting. With the four-minute, 46-second Recording Sessions, we hear from Minkoff and Allers. After their intro, we see movie clips that also display matching elements from the recording studio. It’s too short and scattered, but I do like the glimpse of the actors at work. Inside the Story Room breaks into five sub-domains. Equipped with more intros from Minkoff and Allers, these fill a total of 23 minutes, 42 seconds. “Room” lets us see “story pitches” as well as concept art and other background elements. It becomes a good look back at the movie’s original planning sessions and becomes one of the disc’s strongest extras. For the final new feature, we get Nathan and Matthew: The Extended Lion King Conversation. Shot for a featurette that appeared on the prior Blu-ray, this seven-minute, eight-second reel offers a chat among producer Thomas Schumacher and actors Nathan Lane and Matthew Broderick. I enjoyed the clips from this group in its shorter form, so I’m glad to get more time with these three. The disc opens with an ad for Coco. Sneak Peeks adds a promo for The Lion Guard. No trailer for Lion King appears here. 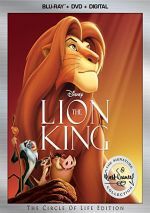 A second disc provides a DVD Copy of Lion King. It includes none of the Blu-ray’s extras. If you look at my review of the original 2003 Lion King DVD, you’ll see that a whole lot of extras didn’t get ported over for this set. This version also drops bits from the 2011 Blu-ray. However, Disney claims that you can still access them – you just can’t find them on one of the package’s disc. You can locate them via the “digital copy” of the film, and that stinks. It would cost Disney next to nothing to include the features on a disc – I hate this “digital only” nonsense. That said, The Lion King would earn my recommendation even if the Blu-ray included no supplements. The movie stands as one of Disney’s finest and contains to impress after 17 years. The Blu-ray presents excellent picture and sound, but it offers a downgrade in terms of supplements. I do love the movie, but I prefer the prior Blu-ray due to its better batch of bonus features – and still own the DVD to have all the extras.